Renovated and newly furnished apartment in the middle of the media harbor. Beautiful living and sleeping area, with double bed, ideal for one or two guests. Small mini kitchen, TV / DVD, fast wifi and separate bathroom with shower. In the 2. Floor with lift. Cool part of Dusseldorf with a lot of nightlife and restaurants. Only 5 minutes to the Rhine! In 15 minutes you are on foot in the old town. The apartment is located in a quiet side street. Flexible check-in until late at night. Large double bed (140x200cm) with new mattress (2017). - dishes / pots etc. - Iron and ironing board and clothes horse. Washer and dryer in the basement can be used around the clock. Thorough cleaning by professional cleaning service. Of course, with fresh linen (bedding, towels, bath mat, tea towels etc). During your stay, the whole accommodation is at your disposal. You get keys for front door, apartment and cellar. 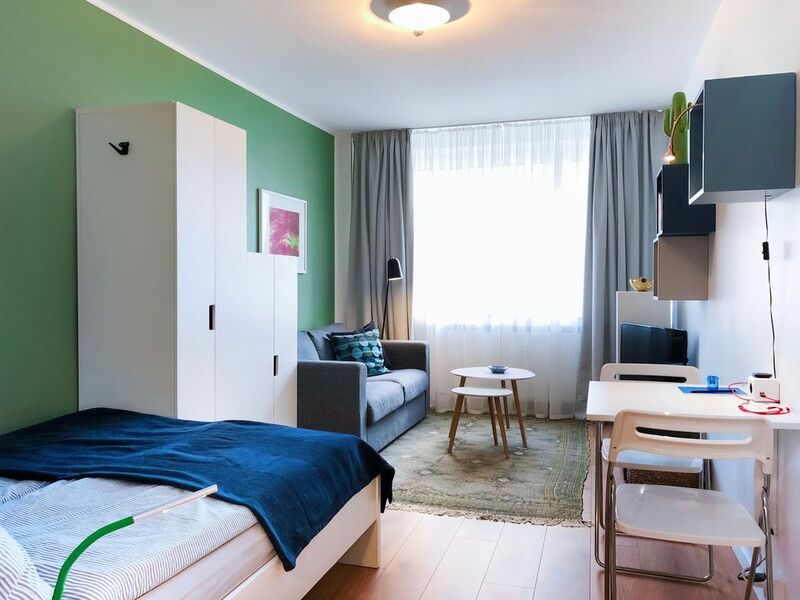 Before your arrival, you will receive my online travel guide with important information about the apartment as well as my personal recommendations for Düsseldorf and the Medienhafen. The check-in / check-out times are only approximate. If other times are desired, please mention in the request. The apartment is in the 2. Floor (elevator available). Apartment directly in the media harbor in the district Unterbilk, in a quiet side street (dead end). Many shops and restaurants are within walking distance z. B. at the Lorettostrasse. Small kiosk around the corner, not far to the supermarket. The Media Harbor with its architectural highlights such as the Gehry buildings, the Rhine Tower and the old town and the famous Königsallee are also within easy walking distance. The apartment can be easily reached by public and private transport. If you arrive by plane in Düsseldorf, it is best to take the train from the airport to the main station. The trains leave from tracks 4 and 6, the journey takes only 7 minutes. From the central station it is best to take bus 732 to the stop Rheinturm (14 min). The nearest public parking garage is located directly opposite the main street (Stromstrasse) at the Gehrybauten. With a bit of luck you could find a parking space in the street. Sehr schönes Appartement in einem ruhigen Haus. Nahe des nächtlichen Geschehens in Düsseldorf. Gerne wieder bei unserem nächsten Besuch in Düsseldorf.